Business design refers to the experimental and agile development of new business models and services. The development work combines strategic know-how, design thinking, technological capability as well as people in the midst of change. 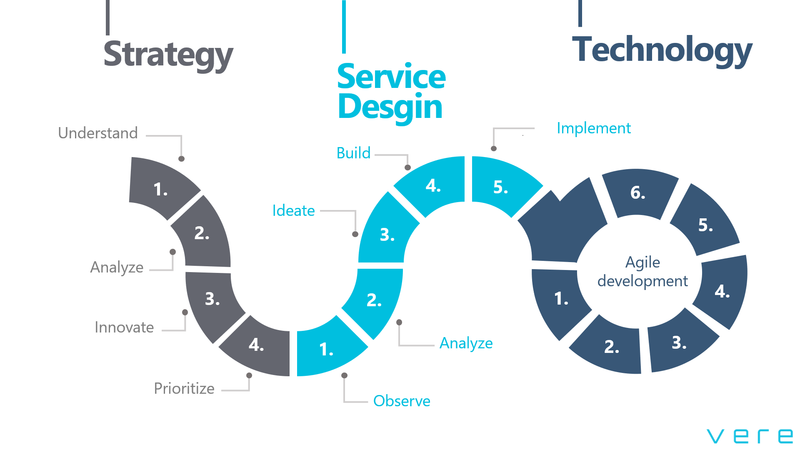 The business design process encompasses three stages. In the strategic stage, we prioritize development entities. The service design stage creates new business and service models. In the final stage, the technology stage, we finalize the concept and create a digital service when necessary. In the strategic stage the aim is to gain understanding about which development entities the company should prioritise in the development process. The work proceeds in four stages. In the first stage we gather information in order to comprehensively understand the entity of interest. This stage includes primary and secondary research, both qualitative and quantitative. In the second stage we break down the results and present them in an user-friendly manner. The third stage is for enriching the existing information and based on it we innovate possible development entities. In the last stage we prioritize the development entities. As the result of the strategic stage the company ends up with prioritized development entities. The design process can begin based on the chosen development entities. The aim of business design is to create new business models and services based on the chosen strategic development entities. Business design is based on “Double Diamond” - thinking. We scrutinize the development entity chosen in the first stage, emphasizing research methods that encompass observation. The information gathered in the second stage is analyzed and summarized, whereupon we innovate solutions to the diagnosed challenges. At the end, based on the selected entity, a prototype is built and implemented as a part of everyday business. The final stage of business design is based on agile software development principles. We utilize distinguished Agile-methods in development. In agile development communication, fast responsiveness to change and risk minimization is emphasized. Software development is based on short iterations.